An agreement for credit of US $ 165 million (equivalent) from World Bank for Maharashtra Rural Water Supply and Sanitation Program was signed here today by Shri Nilaya Mitash, Joint Secretary, Department of Economic Affairs, Ministry of Finance on behalf of the Government of India and Mr. Micheal Haney, Acting Director, New Delhi Office, World Bank on behalf of World Bank. Similarly, the Program Agreement was signed by Mr. Kiran Kumar Dinkarrao Gitte, Deputy Secretary, Water Supply and Sanitation Department on behalf of Government of Maharashtra. 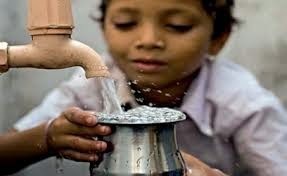 The Objective of the program is to improve the performance of Maharashtra's sector institutions in planning, implementation and monitoring of its Rural Water Supply and Sanitation Program and to improve access to quality and sustainable services in peri-urban villages, and in water-stressed and water quality-affected areas. The Program will have three main components: (i) Institutional capacity building for planning, implementation and monitoring of the sector across the state, ii) Water Supply and Sanitation Service Improvements in selected districts. The closing date for the Project is March 31, 2020.